The correct alignment of your wheels is very important. Incorrectly aligned wheels can wear your tyres more quickly, affect the handling of your car and even cause you to use more fuel. 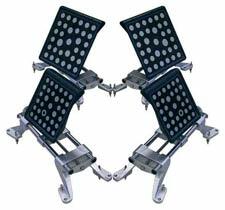 Ask us to check and adjust the alignment to correct any problems. The correct tyre pressure is vital for both safety and for extending the life of your tyre. You should check your tyre pressures monthly, including the spare and before any long distance driving. Make sure the tyre pressures match the pressures recommended by the vehicle manufacturer. Tyre pressures should if possible be checked cold. If tyre pressures are checked hot, add 4 to 5 psi (0.3 bar) to the recommended pressures. In the case of unusual pressure loss, the internal and external condition of the tyre should be checked, as well as the condition of the wheel and valve. Maximum grip on the road is vital for road safety. This can only be achieved with the correct pressure in your tyres. To reduce the impact tyres have on the environment and to promote road safety, a new EU regulation came into force on 1 November 2012 that is designed to make it easier for motorists to compare different tyres. From this date all new tyres for cars, vans, 4x4 and most trucks have to display a standard format label that indicates three key aspects of a tyre; fuel efficiency, wet grip performance and external rolling noise. Similar in style to energy labels for white goods, these labels provide comparable information about a tyre regardless of the brand or tread pattern. By using clear pictograms, the label allows motorists to make informed choices when buying tyres, ranked on a scale from A (best) to G (worst). Certain types of tyre, such as; T-type temporary use tyres, off-road tyres, racing tyres, vintage car tyres and re-tread tyres are excluded from this regulation. Tyres are responsible for between 20 and 30% of a vehicle's fuel consumption. As a tyre rolls it uses energy and so a tyre that has a lower rolling resistance will use less energy and this has a direct impact on fuel efficiency and CO2 emissions. Choosing tyres ranked A (best) over tyres ranked G (worst) can reduce fuel consumption by up to 7.5%. This equates to a typical annual fuel saving of 120 litres or £168 (based on 12000 miles and £1.4/l). Currently D is not used on the scale to provide a clear distinction between higher and less efficient tyres. All cars should have their wheels aligned professionally every year or at their scheduled service interval.The good news is D&R Tyres offer a state-of-the-art wheel alignment service. Using digital cameras our new 3D Image Aligner captures your vehicles alignment in 3 dimensional space without reference to the lift or the horizontal plane. By placing reflective targets on the vehicles wheels, full alignment readings are achieved. If adjustments need to be made we will complete the work there and then. Do you feel your car pulling to the left or right? Is there a vibration in your steering wheel? These are indications that you may be in need of a proper wheel alignment. Performing a wheel alignment will help reduce uneven tire wear, increase the life of your tyres, increase petrol/diesel mileage and provide you with an overall safer drive. 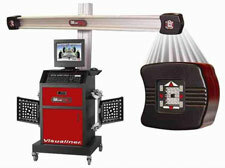 D&R Tyres offer the latest in 3D wheel alignment technology. 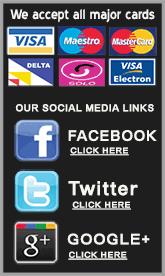 Our wheel alignment system allows us to provide you with quick service with the most precise level of calibration. 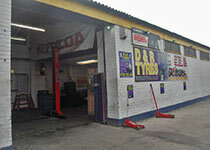 Notice any signs of improper wheel alignment - bring your car into us and we'll have a look. 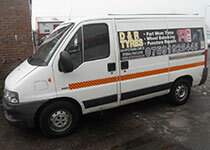 Our service is FREE and a computer printout is provided - You only pay us if you would like us to re-align your wheels. Wheel Alignment or tracking, is important for good road holding and to maximise the life of the tyres. Hitting a kerb or driving at speed through a pot hole can result in misalignment. To have your wheels aligned by us simply pop in and see us. 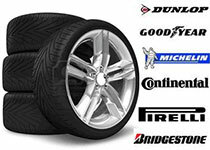 For most cars aligning the front wheels will resolve many of the uneven tyre wear problems. However there will be some cases where all 4 wheels will need to be aligned. On checking your vehicle our technicians can advise on requirements and if adjustments can be made will advise of the additional cost. There is no set pattern to wear and tear, it can be down to type of driving, location etc. On a front wheel drive car the front tyres will usually wear more quickly due to the increased work load on the front axle. High performance cars will also wear tyres much quicker than a less powerful car due to the additional power going through the drive wheels. Premature wear can be caused by incorrect tyre pressures, incorrect wheel alignment or overloading of the vehicle. This will cause the tyres to wear more in the centre of the tread as the central section bulges out. An example tread depth reading would be 4 - 2 - 4 mm. This will cause the tyres to wear more on both tyre edges as the central part bulges in. An example tread depth reading would be 2- -4 - 2 mm. We recommend that you visually check your tyres weekly for signs of wear or irregular wear. If in doubt call into see us for a free check.